New automotive DIYer here, seeking help and guidance on getting ready to use new jack stands. two jack stands, and a creeper. Anyway, while unboxing the jack stands today, I noticed that that on the base, just below the handle, they have some kind of metal "tab"
that apparently you're supposed to bend in. 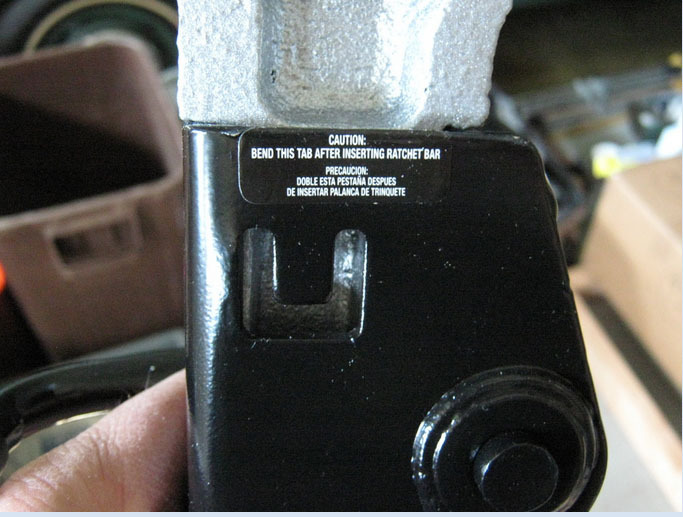 It reads, "Bend this tab after inserting ratchet bar"
any that I can see. It seems easy enough to do, but I'd like to know the purpose of this metal tab beforehand, if anyone knows. I personally am not familiar with jack stands with some tab you are supposed to bend and for what! I'm worried about these already and the last place to skimp is on safe, strong jack stands. No jokes now. If those are pressed or stamped metal I already suggest dumping those for better ones. If you can post a picture of them it would help. Please, bargains are great and some for real some not. Hoisting a vehicle is critical to do with good stuff that is safe on a good surface as well. Know you jacking points and where to place jack stands perfectly - not much room for errors with that. That tab is to prevent the shaft from falling back out after it is inserted. It acts like a stop so if you pick up the stand by the shaft, it won't come out in your hand. T, thank you for your reply and advice. It is truly appreciated. Yes, I have done my "homework" for safe use of the jack, for the most part. I'm sure I will have a question or two when I'm in the midst of doing the oil change. I did research the jack points for the Subaru 2010 Outback 2.5i. 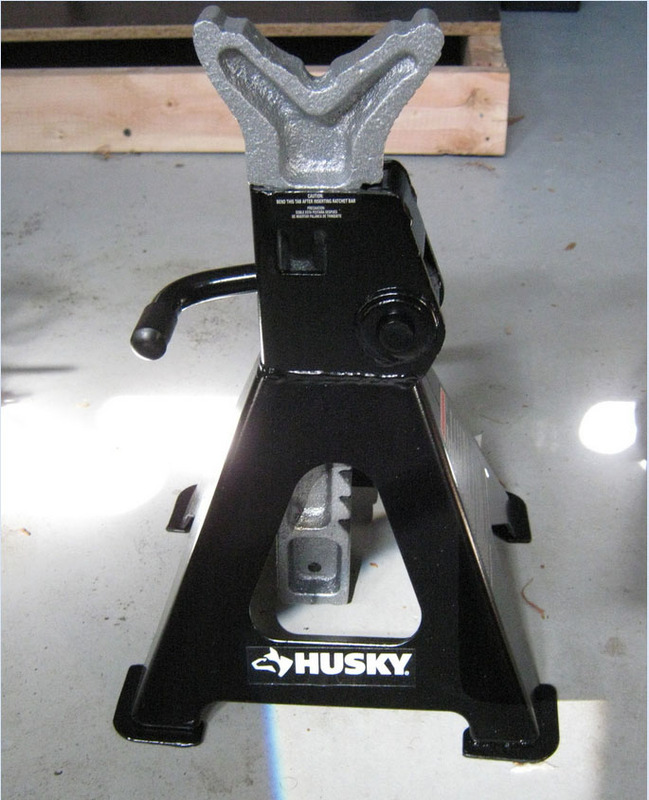 The jack stands appear strong, they are Husky brand, although they apparently are made in China, which is a bit unsettling.. I'm definitely interested in getting a quality set of stands. If you could recommend a brand, that'd be great. I will attempt to copy and paste a pic. If that doesn't work, I'll upload it to an image hosting site. to confirm it, but your explanation sounds totally reasonable. OK with all seen. For OP, if there's some part to them you can't find any purpose for at all that I don't get. A jack stand is pretty much like they've always been. ^^^^ Was there marketed thru a home center still fine. 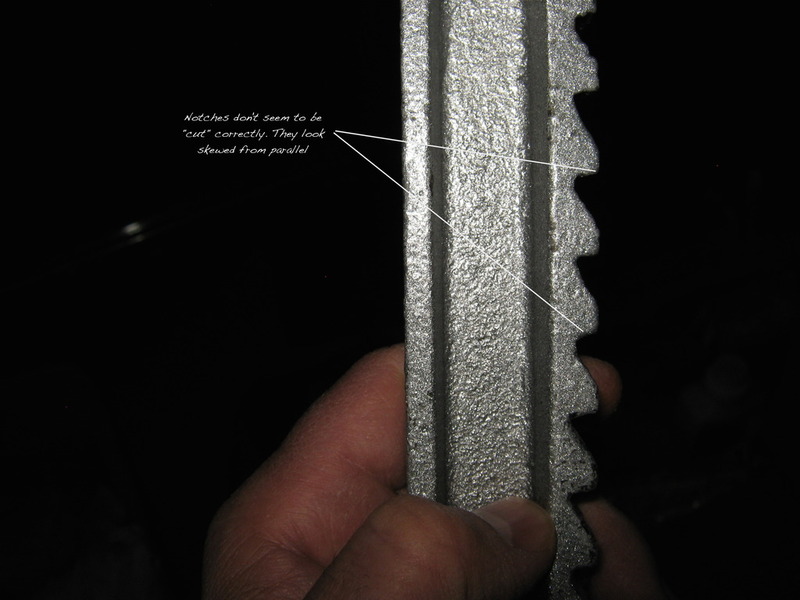 UNDERSTAND THE TOOLS AND EQUIPMENT YOU ARE USING no matter what detail. I do refrain from real cheap stamped stands with a pin on a chain once had them collapse - nobody around at all. That particular two stands found the recycle bin fast. YOU said you were new and DIYing as we all were. I'm glad you are asking. Nothing is really more primal than having to hoist a vehicle and know it's secure for what you need to do and of course extra important if you plan to be under it. Again - don't forget the surface and include it being a LEVEL surface. Concrete is probably the most common safe surface. Asphalt is used a lot for driveways and other. Not good for much more than quickly changing a tire for example and really not good if hot. Dirt, gravel, lawns and places on a slope are a no go! Yes - you can use plywood, wood blocks mentioned and used but still need to know it's good wood all depending. Some avoidable goof ups with all this on a creeper under a car. Extension cords, air hose, clothing getting caught up in wheels of creepers, pinched by a floor jack. Trouble lights (damn things) that are so hot you burn yourself. Wild assortment of things to see what you are doing more than ever. Cordless LED stuff can be great and quite reasonable cost. Expect to break some of this stuff. No joke, for what ever working reason the things called a "DROP LIGHT" are aptly named, bulb blows, glass all around. (Note to self: use HTML url tag when in Basic Editor mode. Thank you Tom. Yes, the Husky items you posted appears to be the precise kit I got. What you have written has gotten me to thinking more carefully at the quality issue. And how to use the items properly. I certainly do not want to hoist anything unsafely. I plan to do oil changes and tire rotations, on a modern Subaru and, a bit later, on a MB 1962 Ponton. My driveway is not concrete, but seems to be a hard enough blacktop. No gravel, lawn, or inclined plane will be used at all. It is "dead flat" as well as level. I was considering using the creeper, but now I don't think I'll really need it, it's just oil change and rotations of tires. Until I have more experience, then yes, I'll try it out. Until then, it looks like it might creat more risks than it's worth for me. I'm really concerned now about the stamped metal thing. I'm not sure if it is stamped or not. The stands do not have a pin. If you recommend against stamped, I just may look for a different set or return the kit. How to tell if it's stamped? Chiwandia jack stands. Don't think you should risk your life on cheap stands...IMO. When it doubt, don't do it is my motto when doing vehicle maintenance. Good thing your asking questions too. Off the top of your head, know of any made in the USA? Which brands would you recommend? You are only allowed to link to your own pictures or videos. FYI, the are the exact style of possibly a 50 year old set I have had since bought used still perfect, made in USA and embossed 1.5 ton rated and know they can do double. Like that style of many owned. One hand release, square bottom fits a square board well vs any tripod style. The lift bar you asked about the "bend this thing" on mine is a roll pin that would have been there new before an end user ever touched them just so it can't come out on it's own. Any question about the quality of stuff of the sort don't go there! I'll look at some in person when can as HUSKY brand stuff is sold at a Home Depot I do frequently go to. If I see those and find them junky in any way I'll be back to this thread to say I don't like the look of them at all. They may be just fine?